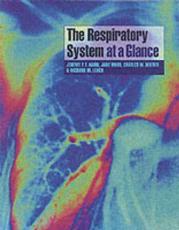 The Respiratory System at a Glance is the latest system-based addition to the popular at a Glance series and provides a concise, readily accessible introduction and revision text. The book covers all aspects of the structure and function of the respiratory system as well as the diagnosis and management of key respiratory diseases. The text begins with anatomy, gas laws, lung mechanics and circulation, progressing onto respiratory failure, respiratory diseases, occupational and environmental aspects of lung disease, and also includes related topics such as sleep disorders and mechanical ventilation. Four case studies reinforce the systemic approach to learning found in most medical schools around the world. Each topic is presented in the now familiar at a Glance easy-to-learn double-page spread format with clear informative diagrams supporting the text. The book will be an invaluable resource for medical students at all levels following both integrated and traditional courses, as well as for students of nursing and other health professions who need an introduction to the respiratory system. Examination candidates will also find it a useful means for review.